I thought the best way to start this series was by providing a brief history of the depot. 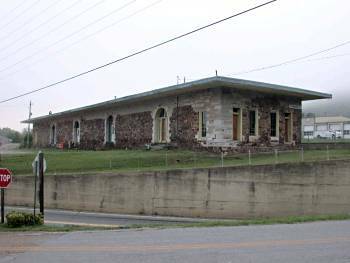 This will allow the reader a brief glimpse into the past to see some of the development of Ringgold and its depot. I am hoping to also demonstrate that the town is anything but a secluded entity in the mountains of Appalachia. It was, and very much is today, connected to the markets around it including those of the deep South. Additionally, due to the town’s natural geography, Ringgold developed as a crossroads and what many call a “gateway” to Georgia. It is this gateway that helped bring Ringgold its commerce, its depot and eventually, the Civil War. Although Ringgold’s developing economy undoubtedly played a role in the location of the depot, the primary reason was geography. The mountainous terrain around the region made it difficult to travel and even harder to ship. Cherokees founded the settlement of “Cross Roads,” which would later become Ringgold, on a natural crossroads. The waters of the Chickamauga Creek over millions of years helped cut a gap between White Oak Mountain and Taylor’s Ridge. This natural gap gave travelers an easy pass, through the mountainous region effectively turning “Cross Roads” into a gateway to the deep South. In this gap three major roads, including a federal highway converged. It is through this gap, that the Western & Atlantic Railroad laid track, rather than construct a tunnel or take the long way around. In more recent history, it is through this gap that the government constructed Interstate-75. Without the gap, it is unlikely Ringgold would have ever prospered, turning instead into one of the many communities and settlements that have vanished in the region. White Oak Mtn. is left off of this map, but it runs north of Ringgold towards Tennessee. During the Civil War, Ringgold played host to various events brought on by the conflict. A great many of these were minor skirmishes and troop movements attached to the various battles around the area. (Chickamauga, Chattanooga, Atlanta Campaign). One of the most notable troop movements involved James Longstreet’s corps, which arrived as Catoosa Station outside of Ringgold, and marched through town towards Chickamauga. Additionally, it is from the Ringgold depot that many boys and men, from the town and surrounding countryside, departed to fight in the Civil War. These future soldiers of the Confederacy fought primarily in the Eastern Theater, with the Army of Northern Virginia. In 1862, one of the more interesting moments in the Civil War brought the town to its toes. On April 12, 1862 James Andrews and his “Raiders” stole the “General” locomotive in Big Shanty (Kennesaw today) Georgia. The goal of this daring mission was to travel towards Union held Chattanooga, Tennessee via railroad and cause damage to tracks, bridges and telegraph lines as they went. This plan was largely stalled through the sheer will and determination of the General’s conductor, William Fuller. He chased the General from Big Shanty by foot, handcart and eventually train while steadily gaining on the General. At about 1:00 PM, the General raced by the Ringgold Depot with the “Texas,” another locomotive commandeered by Fuller, in hot pursuit. Just a few miles north of town, the “General” stalled and the “Raiders” took to the woods. Local and Confederate authorities pursued. Other explanations pertaining to the depot’s damage include Confederates attempting to blow the depot up, denying the Union Army of its stores and function; and the Union army under orders from Sherman, intending the same. Whoever did “blow the depot up,” only managed to blow the roof off of it and a large corner portion. It is debatable which did more damage, the explosion or Cleburne’s Napoleons. 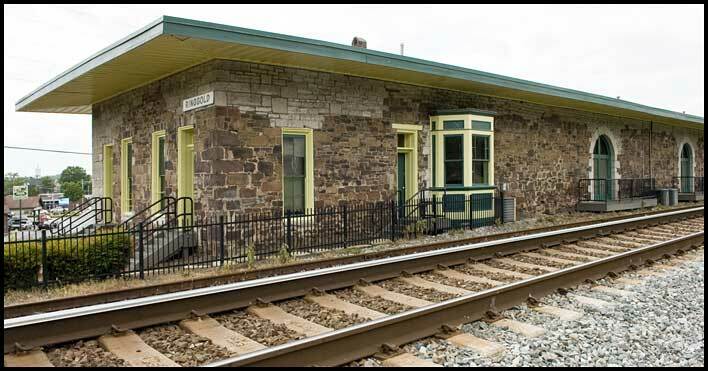 After the war, the depot was rebuilt using local limestone. The choice of a different rock for use in repairs, left visible scars for visitors to see today. Ringgold was named after Maj. Samuel Ringgold shortly after his death in the Mexican-American War. William H. H. Clark, History in Catoosa County, Vol. II, (Wolfe Publishing, 2003), 86-87. Andy Ambrose, “Atlanta,” New Georgia Encyclopedia, (2004), [http://www.georgiaencyclopedia.org/articles/counties-cities-neighborhoods/atlanta], “Building the Western and Atlantic Railroad,” About North Georgia, [http://www.aboutnorthgeorgia.com/ang/Building_the_Western_and_Atlantic_Railroad]. “Ringgold Depot,” Roadside Georgia, [http://roadsidegeorgia.com/site/ringgolddepot.html].